As part of the Voice of a Generation tour we were lucky enough to be able to speak with a group of young asylum seekers and refugees in Leicester. This is a group who very rarely have their voices heard in the media, even on issues where they are the focus. The group we met with were attending an evening class run by a local charity, After18, with volunteers helping members of the group with their studies through one to one and group tuition in Maths and English. We spoke about various topics that come up regularly in the run up to the election in May. What was quite apparent was how hard many of our participants have found it to make a life here, but the drive to work hard and succeed is just as clear. Talking about voting in the UK, and the fact that many young people eligible to vote in May will not go and cast their ballot, Eva said quite simply: “It’s not a good idea not to vote”. “If I don’t vote, I still have to follow what the rules are”. This point is particularly prevalent as those in the asylum system are dependent on the state for support as you are not allowed to work while going through the asylum process, which in some instances can take years. One issue that came up a lot, and a topic that has been raised in many of the locations the Voice of a Generation tour has been around the country, was education. Some of our participants had received a good education in their home country before having to flee to the UK, while others did not. But, regardless of their level of education before arriving, everyone we spoke to felt they faced real challenges. Those who already had qualifications were not able to make use of them and had to re-train to attain British qualifications. This left some people feeling constrained and as though their time is being wasted where they would rather be finding work and moving on. For others, getting onto appropriate courses can be hard. 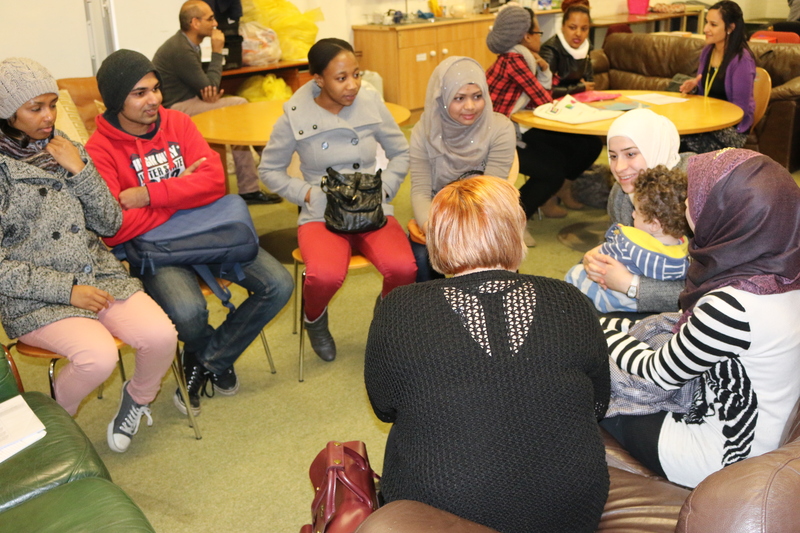 While the young people we spoke with thought ESOL courses were good, they are heavily over-subscribed and sometimes asylum seekers are asked to pay for education which they simply cannot afford. On the topic of welfare and benefits there was a strong sense of the importance of contribution and the desire to be able to make your own way in the world. Hanna felt that the government doesn’t treat people equally when it comes to claiming benefits and trying to find work: “for those people who want to do more, they’re not encouraging those ones”, a sentiment enhanced by a general feeling within the whole group that the minimum wage is too low to make working for a living as attractive a proposition as it should be compared to remaining on benefits. As with all the groups we have spoken with for the Voice of a Generation project the young adults we talked to in Leicester were eager to share their thoughts on politics in the UK, and it was fascinating for Helen and myself to hear first-hand about the issues that they attached most importance to.